Born: June 1, 1981; Queens, N.Y. Experience: Union Square Cafe, Blue Smoke and Tabla, all in Manhattan. 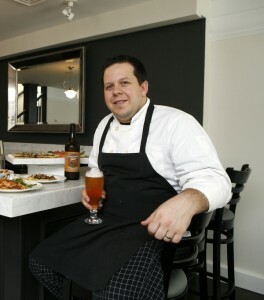 Executive Chef at Tavern in Garrison. Why he’s one to watch: Gabrynowicz is not only a talented cook who uses local ingredients to make gutsy, bold-flavored food — he’s also an organizer. He buys direct from farmers, and credits their ingredients on his menu. He is a force behind Hudson Valley Restaurant Week. His leadership, and his cooking, is refining the Hudson Valley’s culinary identity. Case in point: Over the summer, Gabrynowicz drove from his home in Beacon to Sycamore Farms in Middletown, N.Y., to pick up the first of the local corn. He cut it off the cob to make a succotash of sorts, using just-warmed blueberries (of all things! ), which he served over a silky polenta from Wild Hive Farm in Colombia County, topped with a simply seared Long Island duck breast from Crescent Farms. Mary Lynn Mitcham contributed. Photo by Mark Vergari.